One of the main reasons visitors come to the tip of the Baja Peninsula is for the fishing! Cabo San Lucas is world renowned as a top fishing destination, featured in fishing publications from California to France. There is little question as to why the fishing here is so good. The city of Cabo San Lucas is ideally situated at the tip of the long and thin Baja Peninsula, right in between to large bodies of water, the Pacific Ocean and the Sea of Cortez. Go just one mile off shore and you find yourself in some deep blue waters, full of some of the most sought-after sport fish. Everything from blue marlin to striped marlin and sailfish, from grouper to dolphin, and from snapper to jack crevalle. With the El Nuevo fishing charter, you and 5 of your friends or family will get a chance to experience an actual Cabo San Lucas fishing trip. The El Nuevo is a spacious 33-foot Bertram fishing vessel. This boat provides all the luxury and comfort of an upscale fishing boat. Complete with an indoor cabin, bathroom, fighting chair, and twin-engine inboard Cummins, the boat is one of a kind. 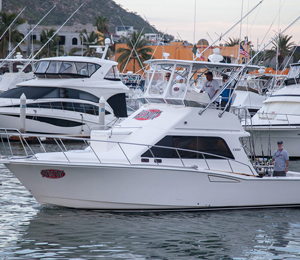 Here at Cabo Fishing Charters, we pride ourselves on our boats and on our fishing captains. These boats are well-maintained and our captains are some of the best around. Our team has been fishing the waters of the Sea of Cortez and the Pacific Ocean for decades, providing Cabo visitors with the kind of fishing trip that you remember for decades to come. So what are you waiting for? Fishing in Cabo is good throughout the year, and the word is out! These fishing charters are becoming more and more popular every year. We highly recommend you set your dates and make your reservation on the El Nuevo as soon as possible to not miss your chance to experience the one of a kind, first class fishing charters that we provide! I have been to the Bahamas many times, but El Nuevo - 33' Bertram is one of my favorite trips! It includes everything that everyone should do here. As a Bahamas veteran, I can say only the best about this experience!